Spike Lee has now officially moved me with his beautiful example of urban filmmaking. This is not just about race relations between blacks and whites, this is a film which explores all aspects of race. There was no favouritism, no ‘who was right and who was wrong’ message, no heroes, no villains, just a day of racial tension on the hot summers day in a Brooklyn neighbourhood. Do The Right Thing follows Mookie (Spike Lee), a young African-American man delivering pizzas for his community under the watchful eye of Sal (Danny Aiello), the Italian-American owner, along with his sons, racist Pino (John Turturro) who detests the area “like a sickness” and the more calm Vito (Richard Edson). During the day, gossip spreads, characters bond and spew insults across various backgrounds (the racist stereotypes scene is a great example of this!). On the other hand, all the characters try to understand each other, such as Mookie wondering why Pino considers Prince, Michael Jordan and Eddie Murphy “not black” which connotes Tino as a bigot, believing stereotypical versions of blacks and arguably won’t change his views. There are so many aspects of the film which make it so very special, the script for example by Lee offers very warm humour throughout which changes quite deeply in its tragic climax to a dark reality of racism. 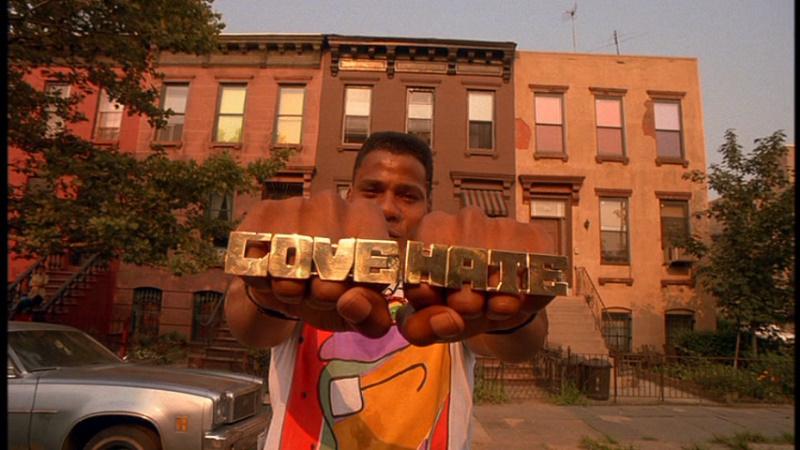 The cinematography by Ernest Dickerson provides a sense of the audience being there in Brooklyn, there is constant use of the forth wall being broken to provide, such as Radio Raheem’s (Bill Nunn) monologue about the meaning of ‘Love’ and ‘Hate’. The music is also well chosen, not only does the audience have the pleasure of having the radio host, Mister Señor Love Daddy (Samuel L. Jackson) playing contemporary genres such as jazz and reggae, there is also the great hip-hop song, that is Fight the Power by Public Enemy as the film’s leitmotif throughout, especially by the committed Raheem on his giant boom box! Besides that, the opening sequence featuring Mookie’s girlfriend Tina (Rosie Pérez) box bopping to Fight the Power greatly excites the audience to this unsettling piece of fiction which feels ever so real. To conclude, one of the best examples of a film exploring tension and certainly the best film I’ve seen by Spike Lee. Funny, courageous, challenging, moving and most of all, compelling.